Millions of avid gardeners will hear seasonal Radio advertising spots for Plantskydd Repellents, presented by well-known gardening personalities* featured on regional broadcasting stations throughout the United States. ** John Cretti, George Dege, John Dromgoole, Ken Druse, Nick Federoff, Pawl Hollis, Fred Hower, Mike Nowak, Paul Parrent, Angelo Petitti, Jos Roosen, Bob Tanem and others. Pettiti Garden Centers, with 9 stores in and around Cleveland Ohio, ranks as one of the ‘Top Ten’ Independent Garden Centers in terms of sales in the USA. 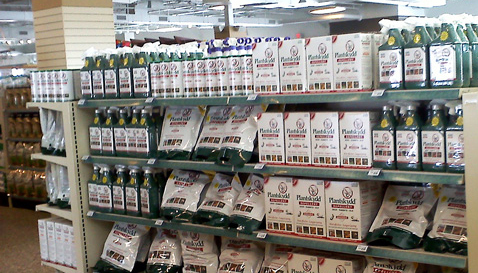 Petitti’s prominently features Plantskydd® Animal Repellents in all of their stores; and on their weekly Radio Garden Show. Plantskydd is widely talked about in the media throughout the year, with product mentions by some of green media’s biggest radio and TV personalities, like ABC TV’s Rebecca Kolls Garden Show. PR Communication with key members of the Garden Writers Association of America. Free sample door-prize promotions for Master Gardener events. Conferences, Industry Trade Shows, and Garden Club Event participation. Plantskydd Repellent is promoted extensively with advertising and “New Product” features placed in consumer and trade publications. TOLL FREE 1-800 number service, available throughout North America, is found on all Plantskydd packaging and collateral materials. Gives your customers easy, direct access to our knowledgeable Plantskydd Customer Service Representatives, who can answer any questions regarding the use of Plantskydd Repellent. This service leads to high levels of “customer satisfaction” and repeat business for you! Our website Dealer Locator Map will direct Plantskydd Repellent customers in your area to your store, meaning more sales for you! Gardeners, landscapers and professional growers increasingly use the internet to search for products to help them solve their plant protection problems. Plantskydd Repellentcontinually ranks high (first page) on internet searches for: deer, rabbit, elk, moose and animal repellents. Internet Search Engine ‘sponsored listings’ advertise Plantskydd 24 / 7 to your potential customers. www.plantskydd.com is included in the World Wide Web Directory, listed with all major Search Engines, and is a ‘sponsored listing’ with Google ® and Yahoo! ®. If you are interested in becoming a Plantskydd Dealer – click here. United States, Canada, Australia, Chile, Japan and New Zealand.